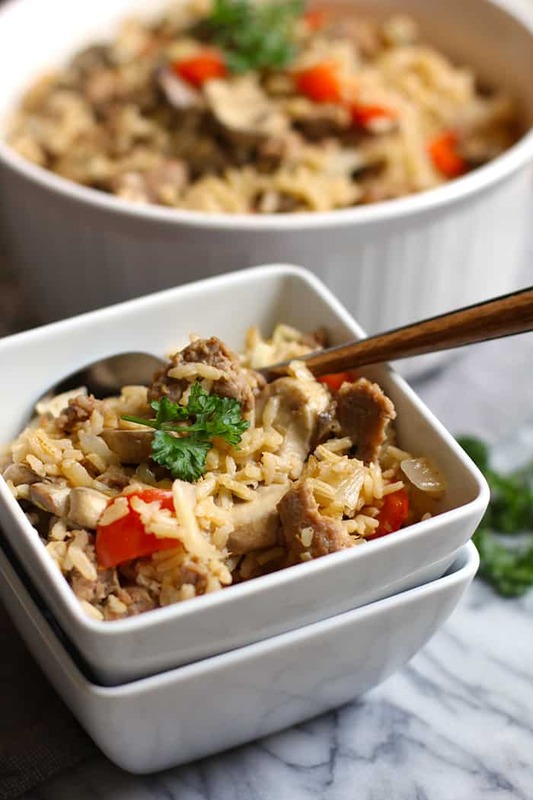 Turkey Sausage Brown Rice is a lean and filling dish, combining Jennie-O lean HOT turkey sausage, brown rice, and a hefty amount of veggies. Perfect meal or side dish for days you are cutting back! I’ve been on the go SO much over the last couple of months. Trips to Hawaii (for our 50th) in January, Iowa (to see my parents) in March, Mom’s weekend in Lubbock in April, and the Smoky Mountains in May with Mike’s dad and his wife. I’m not complaining because we’ve had a lot of fun, but I’m tired. And feeling puffy and squishy around the middle. Peri-menopause doesn’t help, but neither does the wine, beer, pasta, ice cream, and cookies. When I travel, I seem to indulge just a little bit too much. And it’s catching up to me. So this is one dish I almost always make upon returning from any trip. I’ve made it a bunch of different ways, and you can play with the ingredients, depending on what you like. Use any protein you like. I’ve used chicken, turkey bacon, or left the protein out altogether. Sub out veggies. I’ve used celery instead of the pepper, and also added sweet potatoes or butternut squash. You could also use white rice instead of brown, although long-grain brown rice is all I buy now. I also tend to whip up salads of all types after vacationing. But this one is great for the family because it’s.. 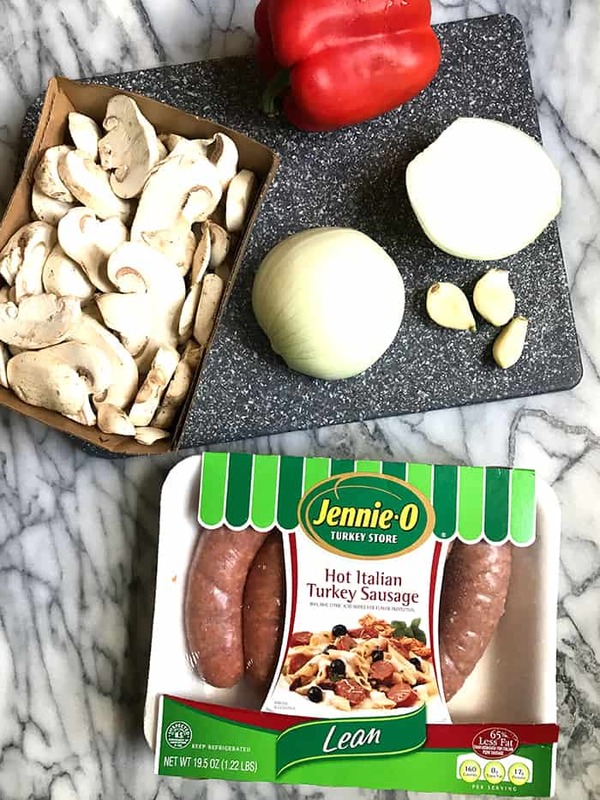 This recipe is not sponsored by Jennie-O, but I’ve used their products for years. This Hot Italian Turkey Sausage is one of my favorites. I love the spiciness. I use it in pasta dishes, in pizza, in soups, and in this rice dish. SO good. 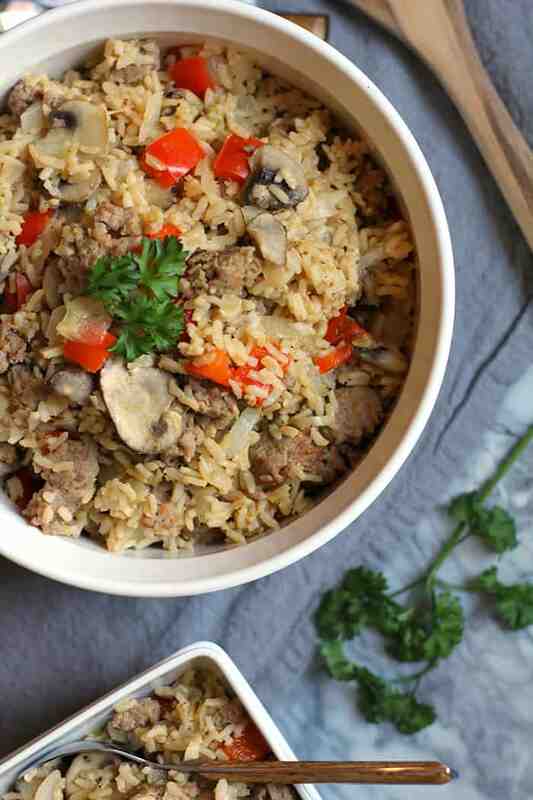 I’ve categorized this Turkey Sausage Brown Rice dish under main dishes AND side dishes, because we eat it as both. When my boys are all around, it’s usually a side dish along with some other protein and maybe some fruit. But when I’m eating it for lunch (because I often times eat the majority of it! ), it’s definitely a main dish. It’s really a complete meal, with protein, grains, and veggies. Some other lean-and-mean main dish recipes I make after over-indulging are the following. And then there are some of my favorite salad recipes. And the all-time lean Balsamic Glazed Brussels Sprouts and Sweet Potatoes. Time to shed a few pounds before I travel again in about two months. All of my siblings and families are gathering in Iowa to celebrate Mom’s 80th birthday and Mom and Dad’s 60th wedding anniversary. Let the cupcakes party begin! 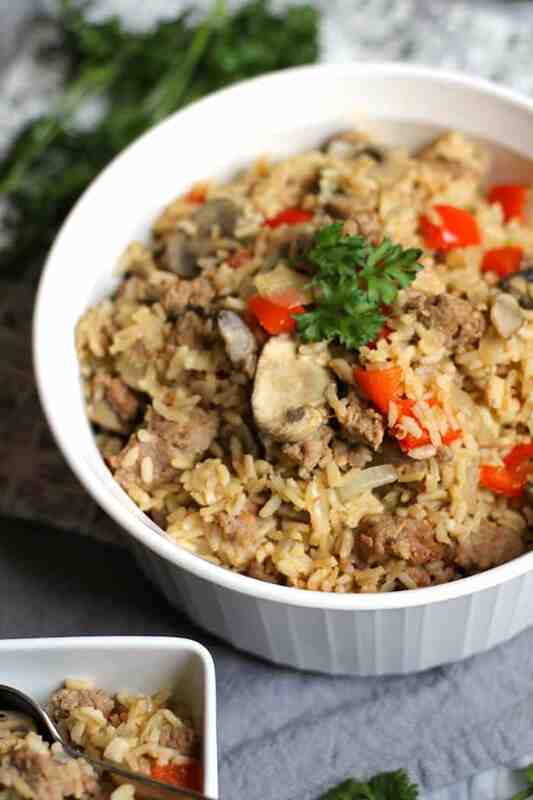 Please let me know in the comment section below if you make this Turkey Sausage Brown Rice, or any of my recipes! I love to hear from my readers. You can also tag me on social media! I’m on Facebook, Twitter, Instagram, Pinterest, Bloglovin’, and Yummly. 🙂 Thanks for reading along! Combine brown rice, water, chicken bouillon, butter, and salt in medium saucepan. Bring to boil and simmer until liquid is absorbed. Remove turkey sausage from casings. Heat large sauce pan over medium-high heat, and one tablespoon olive oil. Add turkey sausage and break apart. Cook until browned and cooked through. Remove sausage to a separate bowl. Add onion, red pepper to same pan with a little olive oil. Add salt and pepper and cook until soft. Add sliced mushrooms and garlic and cook about 5 minutes more. Add back the brown rice and sausage to pan. Check seasonings. Stir to combine and serve. LOVED this recipe!!! 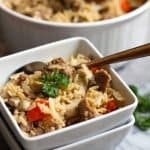 A great quick and easy week night meal! Already decided to have it again next week right before the holiday and all the super unhealthy eating begins!!! Got to be good while we can! Thanks for sharing!! I love it when healthy and tasty intersect! I also love this recipe because it is something different!